We take great pride in helping our clients realize their dreams. Whether it is to sell their current home to move into their dream home or to help them get out of a situation that may not be ideal we give 110% on every single listing we take. If you listen to Shotgun and Charli on Y100, Bill and Rookie on 107.5 The Fan, Glenn Beck or Barba Corcoran from Shark Tank you know these are all people who back us and believe in The Tiffany Holtz Real Estate Group. But in case you still have reservations, you can listen to these clips of actual Tiffany Holtz Real Estate Group clients who we have helped sell their homes FAST and for TOP DOLLAR! Tiffany Holtz Real Estate Group Past Success Stories! The Tiffany Holtz Real Estate Group Past Success Stories! Very organized with a great team. Tiffany started the process immediately and had buyer interest the next day. The planning of staging, pictures, and open houses went very smoothly. My families house was sold in approximately one month, and our new one closed exactly as we wanted. The process was smooth and everybody on the Holtz team worked very hard to make our transition go great. We worked with Tiffany herself at the office for some of the process and she was really sweet and nice. 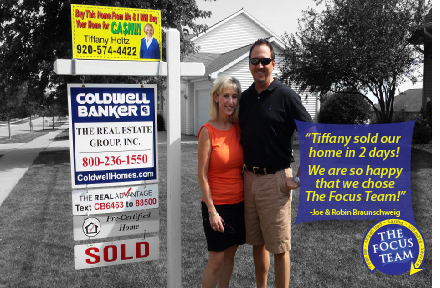 We used Tiffany and her team to purchase a home in 2015. Moving from out-of-state can be a challenge, but Tiffany and her team made it a smooth transition. She was able to accommodate our limited viewing availability and show us a variety of homes that met our criteria. 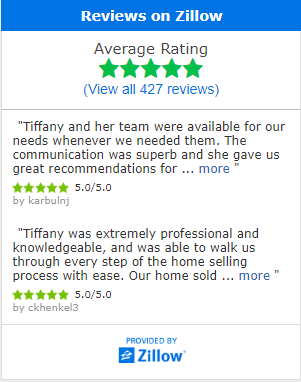 We would definitely recommend Tiffany and her team to anyone looking to purchase or sell a home! The Focus Team sold my house in one week for $2,100 more than list price! The Focus Team was amazing to work with and got my house sold in 3 DAYS!!!! Our agent Brenda went out of her way to work around our schedule and get everything taken care of for us. We moved out of state and were nervous about having a house in a state we didn't live in. The team worked fast and we were able to move without owning a home in WI anymore! We HIGHLY recommend the Focus Team! After coming horrible experienceso with other realtors I reached out to Coldwell Banker to help my fiance and I found a house. We were contacted by Kayla who was fantastic. She began looking for a home that fit our expectations. I couldn't imagine going through this process with any other agency after working with this team. They are truly amazing and helped my fiancé and I found our house before our wedding. Working with Tiffany Holtz's Team, specifically Erica, was the best decision we could have made to help sell our home and find a new home in the area we were looking. Our realtor was wonderful from the very start! She helped us with our staging needs in the beginning and through a rough patch when our furnace needed repairs. She was always quick to respond to our questions and is very knowledgeable about the Fox Valley area. When our house did sell, Erica was right on top of things to get us into a new home that was a great fit for our family. We were very happy to have this group of real estate professionals to work with during what is a very stressful time in the whole process of moving into a new home. Thank you to the Tiffany Holtz Team for making our dream home a reality! Best home selling experience we have had.!!! The listing agent was extremely helpful during the selling process. The call center was always courteous and pleasant. Would highly recommend Heather to anyone looking for a great agent. WOW - What great experience with the Focus Team. My fiancé and I decided to take the plunge and build a new house, leaving us with 2 houses to sell. So we listed her house in March, hoping it would sell before we broke ground in May....In 4 days she had a full price offer!! It almost sold too fast. Our agent Lisa VanDynhoven was very professional and thorough. So it in June I try to sell my house on one of those "by owner" web sites. A bad experience, really no good showings or prospects. So the clock is ticking with our new home being built. So I called my favorite agent Lisa. So before the house is officially listed- we get a hit from Zillow......Less than a week I have a offer that I accept for my house. No pressure no hassle. The highest kudos to Lisa and the Focus Team !!! The Focus Team guaranteed to buy our home so we could buy our dream home. The Focus Team then sold our home in less than 60 days for the full asking price! We found working with her team proved to be our best real estate experience to date. Quick response time, worked really well with our atypical schedule, and we were very pleased with the results. Our house sold in eight days for full price. Tiffany responded to our questions quickly and professionally. Tiffany made the process very easy. I would recommend Tiffany to anyone looking into selli g their home. The Focus Team lived up to their reputation and sold our house in 60 days for asking price! Selling our home always frightened us. Our neighborhood's price ceiling was fairly low and we always worried that we would end up losing money on the sale due to when we purchased and the resale potential. We listed with The Focus Team because we could not afford for our house not to sell fast, and for very close to asking price. The listing process went quickly, and they made sure our home looked fabulous in the photographs. We were really pleased with the overall process. We received immediate attention on the home and had an accepted offer within the first 30 days of the listing going live. If you want to sell your house quickly and get a great offer, I recommend listing with The Focus Team. Our house had an offer on it in less than 36 hours.....wonderful company to work with! They really knew what to do to get your house up to the standards to where it will sell quickly! We are so lucky to have fallen upon Tiffany when we called her to show us a house we saw on Zillow which she was the listing agent for. We had no expectations other than to walk through the house and be on our way; were we wrong. We decided to put in an offer that morning and were extremely taken aback at the urgency it was treated with...we signed papers later that evening. Due to the professionalism and hard work we saw during the purchase of our new home, we decided to list our home with her as well. So very glad we did. During the process Tiffany was extremely busy and did need to travel out of state, but never once was the ball dropped. She, herself, was always there for us, took our calls, and constantly kept us in the loop. We were also impressed with the amazing team Tiffany has put together to work with. The team has the same professionalism and urgency as her. Our house was listed without delay, received multiple offers and sold over the asking price! We could not have asked for a better experience! We have already recommended her to friends and family members. If we ever enter the market again, she will be our first call! !